WCPE Episode 241 – Section Zero with Karl Kesel – WORST. COMIC. PODCAST. EVER! On this week’s episode of the Worst. Comic. Podcast. EVER!, Cullen and Jerry sit down with legendary comic creator Karl Kesel to discuss his book Section Zero. But wait… There is no Section Zero! Karl and artist Tom Grummett first launched Section Zero on an imprint label with Image Comics. The project was put on hold due to other commitments by the creators, until finally it was brought back out last year with a very successful Kickstarter campaign. Section Zero reads like a love letter to Jack Kirby, reminiscent of the comics filled with adventure and action. A government team tracks down the unusual, from UFOs and dinosaurs to aliens and monsters. You know you want to read this, right? Well, good news for you then, as Image Comics will be releasing (or is that re-releasing?) Section Zero beginning in April. Be sure to tell your local comic shop to hold a copy or two for you! We have our Pick 3 choices for books coming out next week at your local comic book shops. John phoned in his pick for the week, and Cullen struggled to guess Jerry’s pick despite a lot of clues. 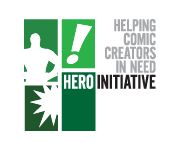 Remember you can find Cullen at the Hero Initiative table at Wizard World Portland, which runs February 22-24, 2019. Cullen will be hosting artist Scott Koblish, who’s most recent work includes runs on Despicable Deadpool and Amazing Spider-Man: Renew Your Vows.